We offer you an exciting new way of getting all your favourite drinks and food at terrific value prices when you’re on the go. At easyCoffee we aim to make things simple, fun and innovative. We passionately believe that excellent products and service and a wide variety of choice should be available to everyone. Please come in and enjoy our fresh bean coffee at great value prices. Whether you’re off to work, heading for the shops or just out with friends, why not drop by and discover easyCoffee, where you’ll find genuine service and impressive value. We opened our first shops during 2016 in central London. Following further high street trials, we have opened our next shops in Burnley, Blackburn, Hastings, Edinburgh, Dartford and Sutton. Watch this space... more to follow soon! Rich, smooth and completely satisfying, our latte is big on taste, flavour and value! Frothy, steamy and foamy – and that’s just the milk! Start your day in an invigorating style with this classic favourite. Be it single, double or even triple-shot, our espresso unfailingly delivers an instant hit. We use a special selected blend of Fairtrade coffee beans for all our easyCoffees, be they morning cappuccinos and lattes or night-time espressos. Our beans are a balanced blend of Arabica and Robusta, washed or naturally processed and sourced from specific countries of origin. It is this which gives our range of coffees the ideal mix of flavour, aroma and body – perfect for easyCoffee satisfaction. We offer a wide selection of hot and cold food to accompany our beverages. 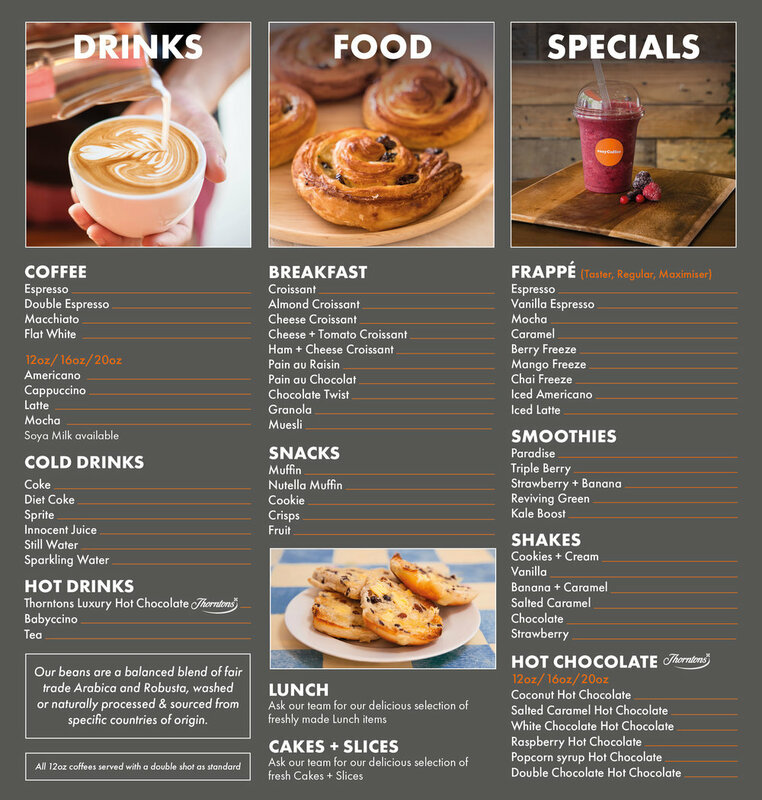 Whether you’re simply after a quick bite to eat or something more substantial, choose from our range of fresh sandwiches, wraps and salads and delicious baked muffins and croissants, and you’re sure to find the perfect food for when you’re hungry and need something on the go.